Mick Madden, age 52, is a metal worker from northern England, who like all lovers of animals, wants his pets to be happy. Watching his neighbors take their favorite dogs for a stroll in the nearby park and then turning to his pet fish swimmiing round and round in a small bowl, he felt they were not seeing enough of the big, bad world. They were missing a lot, and he as their loving caretaker wanted to expand their horizons. And thus was born the goldfish walker. How Does The Goldfish Walker Work? The goldfish bowl fits on a specially designed trolley with wheels that transform the stationary fish bowl into a portable aquarium. Now Malcolm and Ethel can join their owner for walks in the leafy park or trips to the local pub. "They love it," Madden told the press, and he does too. It allows for quality time with his beloved pets and its construction was a welcome challenge to his metalworking skills. 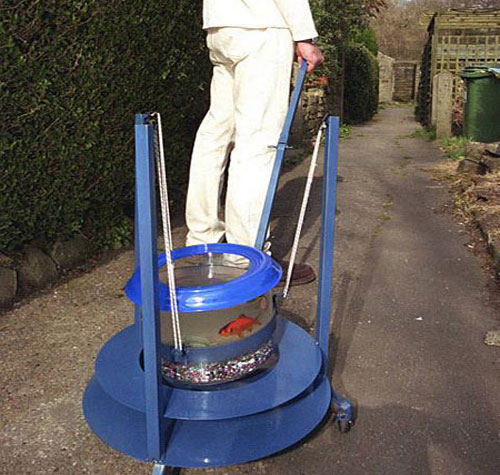 The question cannot help but arise: Will there in the near future ever be a need to hire a walker for the goldfish walker? Perhaps the invention of a new word is in order to avoid redundancy? Oh well, good for you, Mick Madden, and time will tell on the success of goldfish walker. In the meantime, go figure. Welcome To My Mornings -- The Animal Video Of The Day!! !